The “Reliability Toolkit: Commercial Practices Edition” helps both the commercial and military sectors deal with developing and manufacturing reliable products in today’s competitive markets. Over 80 topics, representing every aspect of a product’s reliability over its life cycle, have been well received by thousands of Toolkit owners to date. 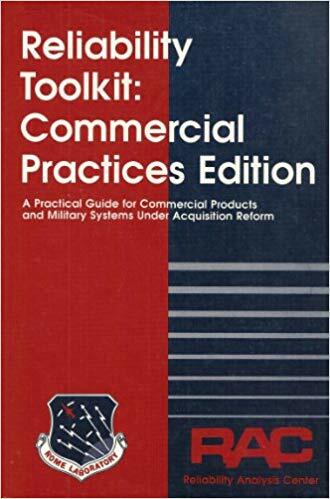 NOTE: The “Reliability Toolkit: Commercial Practices Edition” was published in 1995. It has been updated twice since publication with the latest version, “System Reliability Toolkit-V”, being released July 8th, 2015. The “System Reliability Toolkit-V” expands upon much of the information contained in the “Reliability Toolkit: Commercial Practices Edition”.